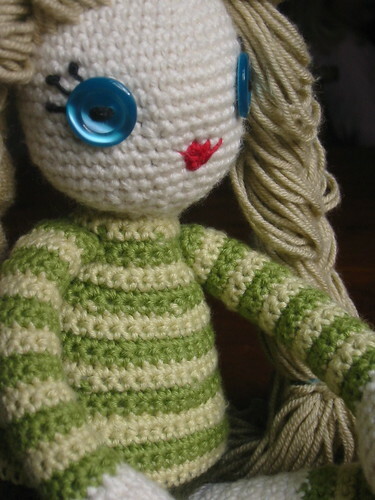 i used rowan wool cotton (which is dk weight) on a 3mm hook for the body. the dress and shoes are worked in the same yarn on a 3.5mm hook. i had 6 50g gram balls and used a full ball of beige for the hair, approx. 40g of the cream (face, hands, legs) and 30g of the remaining colours (light green, dark green, turquoise and yellow). 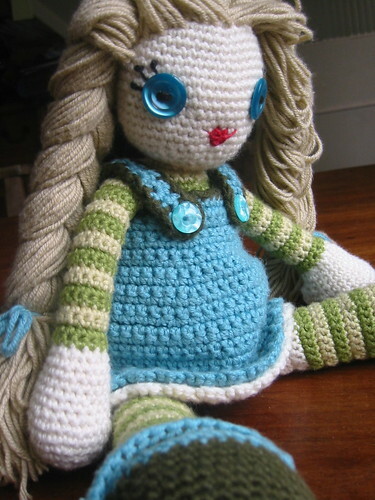 the finished doll is 14" tall. you can use any yarn you like but remember to use a smaller than usual hook to keep the fabric tight and stop the filling escaping or showing through. i worked the striped sections in rows as it prevents the jog at the end of the stripe. 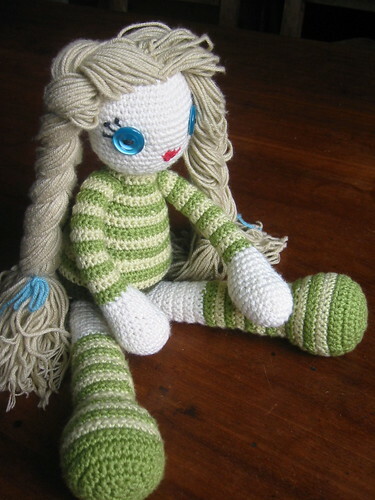 amigurumi is usually worked in spirals and the fabric thus created looks different to that worked in rows. since i prefer the traditional amigurumi look (but hate the jogs) i worked the solid colour sections in spirals - it's easy to switch back and forth - but you can choose to work it all in rows or all spirals if you prefer. to start: use the magic adjustable ring. you may find it helps to use a larger hook for the first row as amigurumi is worked pretty tightly and i find it can be fiendishly difficult to get into this first round of stitches. to work in spirals: place a marker in the last stitch of the round and continue around sc into the top of each stitch (move the marker up into your current round when you reach it). to work in rows: ss into first stitch of current round, ch1, turn. make sure that you then sc into the first stitch (not the chain). it's easy to miss the first stitch which will make your start/end row seam wonky. this is the format i first encountered amigurumi patterns in, and i find it much easier to follow than directions written out long hand. the chart gives the total number of stitches (all sc) in each row. to make life easier increases and decreases are usually made in multiples of 6, distributed equally around the row. you will find that as you work this creates an easily memorised pattern. decreases are usually worked in the same pattern. if the increase/decrease is less than 6, spread the increases/decreases evenly around the row (using the calculation above). in this case i like to alternate where i place the increases/decreases every other row e.g. i feel it makes for a rounder finish if the increases/decreases aren't all stacked above each other but it isn't essential. tip: i find a handy way to keep track of the increases/decreases is to count to myself in 2 different languages, using a foreign language for the increases. e.g. one, two, three, un, deux, one, two, three, un, deux etc. then if i get interrupted i know exactly where i was. i find this comes in particularly handy if you're working greater than inc1 increases. if i stopped at quattre i know i'm 4 stitches into an increase. cunning, no? leave a long tail at the end of each piece as you will use these to sew everything together. stuffing: i weighted the legs and body of my doll, to a height of about 1/3. in future i may not bother to weight the feet, although it does help her to stand up well. the weights i use are called poly pellets and i bought them on ebay. the remainder of the legs/body etc is stuffed with fluffy stuffing. if you plan to machine wash the doll it is worth working circles the diameter of the leg/body at the top of the pellets and sewing these inside, which is very easily done if you remember in time, before you make too many decreases. stitch it in with matching yarn from the outside following the pattern of the crochet stitches and it doesn’t show at all. this prevents the stuffing and pellets mixing inside the body/limbs during the wash, which they will do otherwise. if you prefer you could sew a little bag to contain the pellets instead. always put in more stuffing than you think you should, then put in a bit more, the crochet fabric will stretch over time and you don’t want her to end up too floppy. hair: knot and thread through from wrong side. do this when you have worked up about 2/3 of the head, so that you have a good idea of the shape but still have room to get inside easily. dress: i started by following the increases for the top of the body (from about row 28 backwards, to allow arm room) and i worked the dress in rows to allow for a back opening (she has a big head!). the dress pattern is here. i’m happy to share this pattern but please credit me and don’t use it to make stuff to sell.